Total 5 Screens, All Screens support Digital J2k Format. Screen 1 - 152 Seats | Screen 2 - 211 Seats | Screen 3 - 328 Seats | Screen 4 - 318 | Screen 5 - 131 Seats. Fill the details below to make your campaign! Ad Location! Your ad will run 2 Times Per Show i.e. One Before the movie starts and second Time in the Movie Interval. Congratulations! You have Unleashed freebies for your campaign. Ad Conversation Absolutely Free! Censor Certificate @ 75% Discount! Check this Box to avail the Deal. Still Need Further Customization?Click Here! 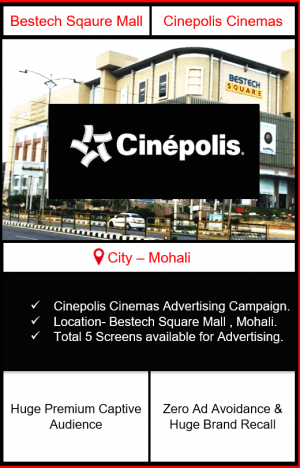 There are Total 5 screens in Cinepolis Cinemas, Bestech Mall, Mohali. All screens support Digital J2K Format. Below are the screen wise details in terms of capacity per show. The screens are strategically combined and are classified into Top Screens. It is done to ensure the easy selection of Top screens in case the client is choosy and does not want to take all the screens available for advertising. The client will select the location of the ad i.e. before the movie starts or in the interval time or both. The campaign usually starts from Friday with the new movie schedule every week. 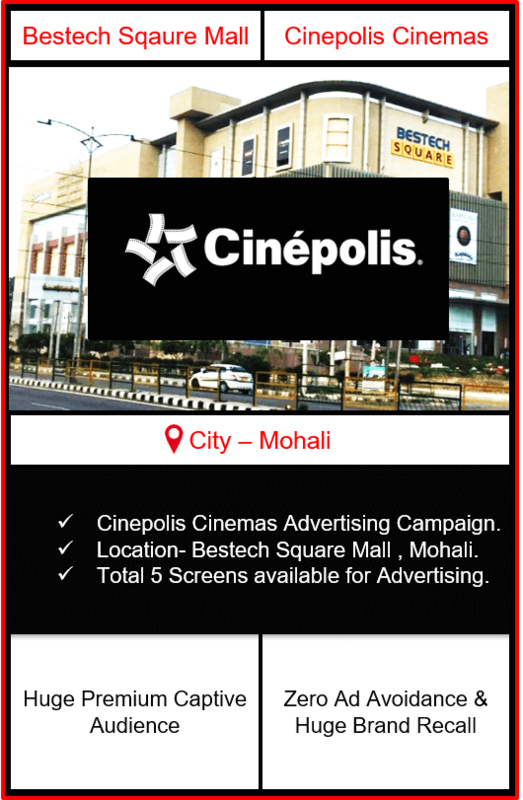 The client’s ad is required in Digital J2K Format for Cinepolis Cinemas, Bestech Mall, Mohali & has to be converted into this format if not done already. In case the ad needs to be converted, the client has to give a link of MP4 Ad which BMK would convert into the cinema compatible format one time absolutely free. Censor certificate is needed & mandatory to broadcast the ad in all the cinemas. If the censor certificate is not ready, the client needs to inform BMK at least 14 days prior to the start date of the campaign since BMK will take all possible measures to get the censor certificate for your ad one time absolutely free of cost. Censor certificate process takes a good amount of time. There can be deviations in the above plan with respect to the availability of screens, on the spot terms & conditions of different cinemas etc. at the time of booking.